Players often exchange "high fives" before or during a volleyball "match." Volleyball is an activity that addresses the problem that, simply put, some college students do not have the stamina to play soccer, the visual acuity to see an object as small as a baseball, the pain tolerance to play football, or the coordination and social skills to be a cheerleader or a synchronized swimmer. While you need not be inept to play volleyball, it does draw more than its share of not-really-athletes. As baseball evolved from the British sport of rounders, volleyball developed from the backyard pastime of catch—notably, the perverse variety of catch that kid brothers play with one another, throwing a ball to deliberately make your brother drop it. It is a tenet of having a kid brother to arrange one's entire life so that everything will seem to be his fault. Likewise, in volleyball, the goal is not so much to do good things, but to do bad things that make your opponent seem worse. Volleyball is played by two teams of six players on either side of a net—not a net as is used to catch butterflies or the criminally insane, but a thirty-feet-long net to separate the two teams. For those without comedic tastes, the so-called experts at Wikipedia think they have an article about Volleyball. Exhibiting incorrect form, or looking awkward (which goes without saying for most players, otherwise they would be in a real sport). 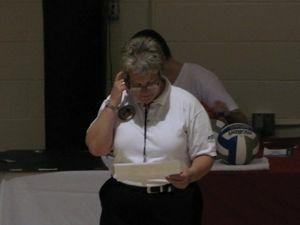 It will take this umpire three minutes to compare the players on the court against the scorecard, but the announcer will entertain the fans by reciting the Sportsmanship Pledge. The rules, refined by the same nation that invented baseball's batting order, reflect the same preoccupation that the occasional good player cannot dominate the game. We can no longer force her to the back of the bus, but we can make her spend half the game in the back of the court, putting yards of distance between her Amazonian physique and the net. Of course, the players spend most of their effort evading this rule, frantically switching positions once the ball is served. Each touch of the volleyball must be momentary. Indeed, as most volleyball players learned the ropes at backyard barbecues, a useful training drill is to use a baked potato, hot off the grill, as a temporary substitute for the ball, to teach proper form through painful reminders. The game is administered by a referee on an elevated platform, and an umpire near the scorer's table. They both watch for nit-picky technical infractions. The umpire also compares the official scorecard with the alignments of the players on the court and scolds the scorer. This takes minutes at a time, but they wrap up their meetings when the fans become so sure they are discussing the post-game meal as to start yelling menu recommendations. Traditionally, in volleyball—taking its cue from tennis—you could only score a point if your team had the serve. Unfortunately, this rendered volleyball as unsuitable for the rigid schedule of TV as tennis already was. Exchanges of serves could last ten minutes without anyone scoring a point. Discussion of who would actually want to watch volleyball on TV is outside the scope of this article, but there is even a Golf Channel on cable TV, for the nation's insomniacs. Modern volleyball uses "rally scoring," in which any screw-up is scored as a point. To keep the duration of games about the same as they used to be, games are now played not to 15 but to 25. (Compare politicians diddling with the tax code and promising that the result will be revenue-neutral.) So you can win a game merely by having an opponent serve into the net. Volleyball players exchange high-fives and strut off the court as though such a victory is some sort of an accomplishment. Even in rally scoring, games must be won by two points. This sop to traditionalists reassures them that a volleyball game could conceivably take forever. Players try to exude confidence and team spirit even though the damned libero showed up out of uniform again. 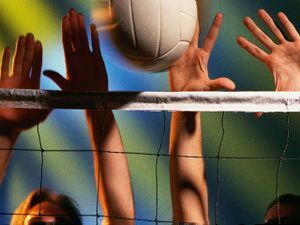 Although volleyball players by definition avoided trying out for a real sport, some have serious shortcomings—literally, as they are under five feet tall and have never seen the top of the net, much less put the ball over it. They become the libero or "defensive specialist," as they are defensive about their small stature. They are allowed to freely substitute for one of the real athletes, but must not perform any move exhibiting real prowess unless they are ten feet away from the net and their shoelaces are tied together. The libero is forced to wear the away uniform and not look like her teammates, as though she left the correct jersey in the dryer. This volleyball Cinderella is consigned to throw herself on the court surface in vain attempts to save balls that no one else can reach. As a further affront, no one even knows how to pronounce "libero." Adding further confusion is the handy game program, although technically this is a libretto. Libero declines in middle age. This is normal. However, in America, it can now be remedied using any of several little purple pills, such as Viagra. The player at bottom, whose uniform identifies her as Rachel, embodies the appeal of beach volleyball. Beach volleyball is an adaptation of volleyball that finally takes into account the needs of the fan. Beach volleyball teams have two players. They are tanned and wear bathing suits and, in the case of women's beach volleyball, very skimpy bikinis. Female beach volleyball players are muscular; they all have such a well-developed six-pack that you can hardly tell which two are the breasts. This is great for the fan's libero. The rules are mostly the same except that—speaking of six-packs—the players drink Budweiser instead of water during breaks.